Description: This class is both informative and fun! Come enjoy Fernwood, explore its natural habitats, as well as make art: nature-art. Learn about nature, cultures, communities, and art through a variety of hands-on nature-exploration skills and art skills. This is a combo indoor and outdoor class; dress for the weather. Parents welcome to attend. Parents must attend with children under 10 years of age. Topics include: making many aspects of a community from scratch from nature; Debris Hut Shelter; Water Filter and Purification; Fire-Making; Food and Foraging; Plant Identification; Cleaning; Community Culture; Landscape Stewardship; Community and Art in Harmony with Nature; up to 17 Nature and Community Art Skills; and many other arts and relating them to nature. 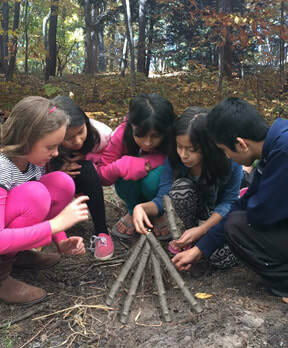 Plus, each class day, students get to enjoy the features and nature of Fernwood. During each class, students will be outdoors, studying nature. There will be outdoor and indoor parts to class. The class aims to help each student develop a (daily or weekly) routine of skills to continue to learn about nature in class and at home and wherever they go, during the school year and beyond. 1. Students pass if they attend 80% of the days of class. 2. Test – required by Berrien Springs. Each student will take a pre-test (10-multiple choice questions), during the first class; and a post-test (same 10-multiple choice questions), during the last class. 3. Scrapbook – Journal, per each day of class. Each student writes and or draws a journal page – a “story of the day” of something the student learned about and or experienced in class that day. Thus, by the end of the semester, each student will have an 8-page journal (scrapbook) on the class. 4. Student Scrapbook – Journal, of the Semester. On the last day of class. On one sheet, each student writes about 3 things the student learned about during the semester. 5. Teacher makes Scrapbook – Photo Journal – group evidence of learning – required by Berrien Springs. Teacher will submit to Berrien Springs, a photo journal of class learning and activities. Teacher will email the photo journal to the students too. -Teacher provides weekly paper info-sheets, nature books, outdoor nature, land, leaves, flowers, sticks, and more. -Required to bring to class (provided by student/family): dress for weather, class is indoors and/or outdoors. Outdoor picnic style Workshop: bring a drinking water bottle, 3-ring binder, paper, pencils, clipboard. -Optional Materials (provided by student/family): picnic blanket, color pencils, pens, markers, hat, snacks, camera. Teacher provides weekly paper info-sheets, nature books, outdoor nature, land, leaves, flowers, sticks, and more. Instructor Bio: Zoe Elrick has a background in education, culture, science, art, history, as well as landscape architecture and ecology. In 2011, she started the Galien Valley Nature and Culture Program (GV-NCP), in Three Oaks, Michigan. Also, she is a registered landscape architect, in Michigan, and works part time for Pizzo and Associates, an ecological restoration firm of prairies, woodlands, and wetlands. Her landscape architecture degree is from University of Illinois UrbanaChampaign. Plus, she has taken classes from the Tracker School of tracking, awareness, nature, and wilderness survival.